A complete denture replaces the natural teeth, and can give you the confidence to smile! They can be used to replace teeth that have been lost due to trauma, decay, or gum disease. Without support from dentures, facial muscles sag, making a person look older. A denture is a flesh-colored acrylic base, with artificial teeth attached, that fits over the gums. The base of an full upper denture covers the roof of the mouth (palate), and the base of a full lower denture is horseshoe-shaped to accommodate the tongue. The appliance is removable. What is the difference between a full denture and a partial denture? 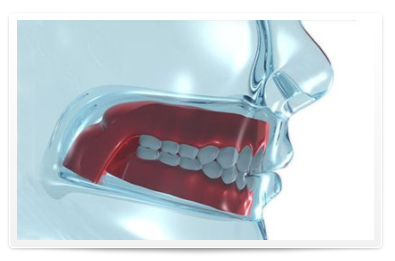 A full denture is a custom made removable replacement for all or most of the teeth. Dentures are made in a dental laboratory from impressions taken of your mouth. They are fabricated and placed in the mouth after all or most teeth have been removed, and tissues have healed. A partial denture rests on a metal framework that attaches to your natural teeth, and contains replacement teeth for the ones that are missing. Sometimes crowns are placed on the natural teeth to serve as anchors for the partial denture. Partial dentures are a removable alternative to bridges. I just got my dentures, and they feel uncomfortable; is this normal? New dentures may feel awkward for a few weeks until you get used to them. The muscles of your cheek and tongue need time to get used to your new mouth configuration, and the dentures might feel loose until the muscles adapt. Soreness and minor irritation are normal for the first couple of weeks, and saliva flow may temporarily increase. These problems should go away as your mouth becomes accustomed to the dentures. Follow-up appointments are generally needed so that we can check the fit and adjust the dentures. With proper care and good oral hygiene, dentures can last 5-10 years. Over a period of time, dentures will need to be relined, remade, or rebased due to normal wear. As you age, your mouth naturally changes. This can cause your dentures to loosen, making chewing difficult and irritating the gums. We can make adjustments or to be sure that your dentures fit you comfortably. Handle with care, placing a towel or basin of water on the counter. Dentures are delicate and may break if dropped. Don’t let dentures dry out. Always place in a denture cleansing solution or in plain water when not wearing them. Never use hot water, as it could cause warping. Brush your dentures daily to remove food deposits and plaque. An ultrasonic cleaner may also be used, but this does not replace a thorough daily brushing. It is a good practice to brush gums, tongue, and palate (roof of the mouth) before you insert dentures. Use a soft bristle brush. This stimulates the circulation in your tissues and helps to remove plaque. Call our office if your dentures break, chip, crack or become loose. Dentures and oral tissues should be checked annually. Damage to oral tissue can occur without pain or symptoms, so early detection is important.